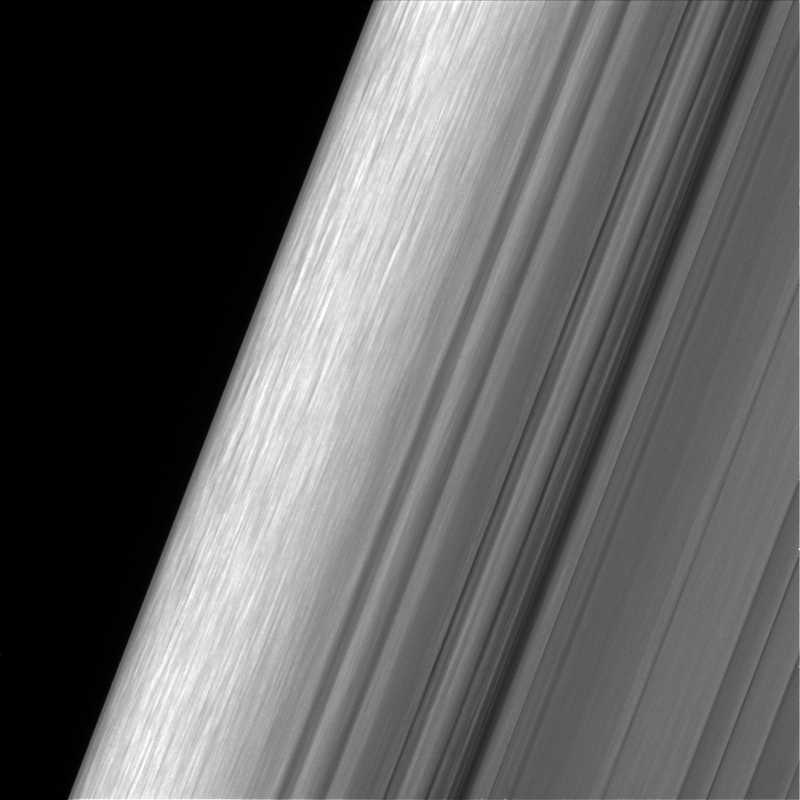 The views are some of the closest-ever images of the outer parts of the main rings, giving scientists an eagerly awaited opportunity to observe features with names like “straw” and “propellers.” Although Cassini saw these features earlier in the mission, the spacecraft’s current, special orbits are now providing opportunities to see them in greater detail. The new images resolve details as small as 0.3 miles (550 meters), which is on the scale of Earth’s tallest buildings. Cassini is now about halfway through its penultimate mission phase — 20 orbits that dive past the outer edge of the main ring system. The ring-grazing orbits began last November, and will continue until late April, when Cassini begins its grand finale. During the 22 finale orbits, Cassini will repeatedly plunge through the gap between the rings and Saturn. 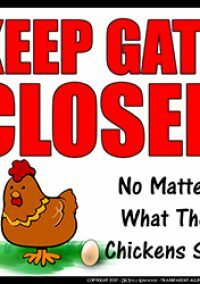 The first finale plunge is scheduled for April 26. This image shows a region in Saturn’s outer B ring. NASA’s Cassini spacecraft viewed this area at a level of detail twice as high as it had ever been observed before. And from this view, it is clear that there are still finer details to uncover. 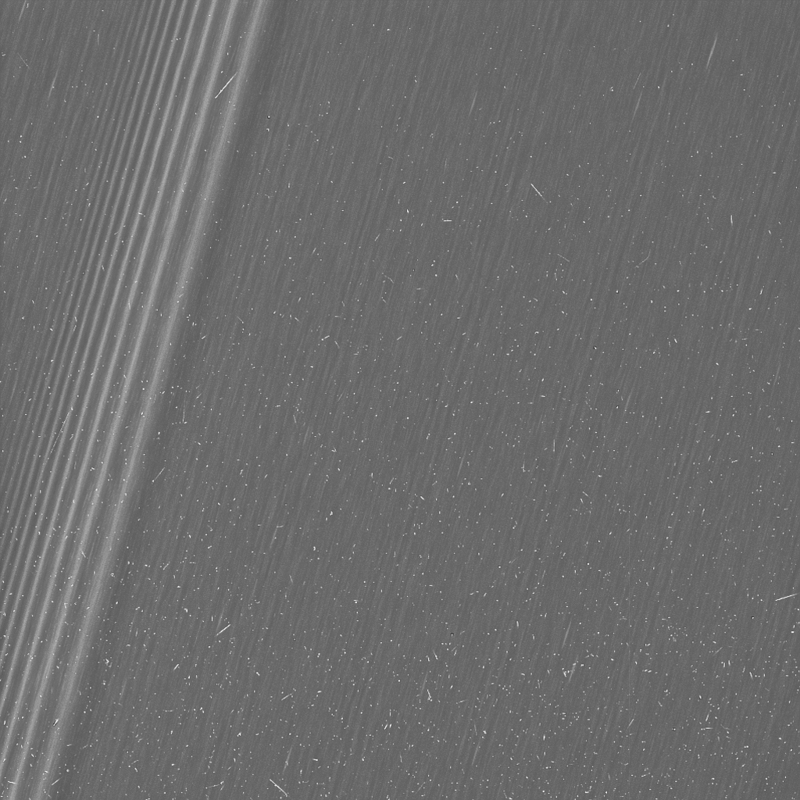 Cassini came a bit closer to the rings during its arrival at Saturn, but the quality of those arrival images was not as high as in the new views. 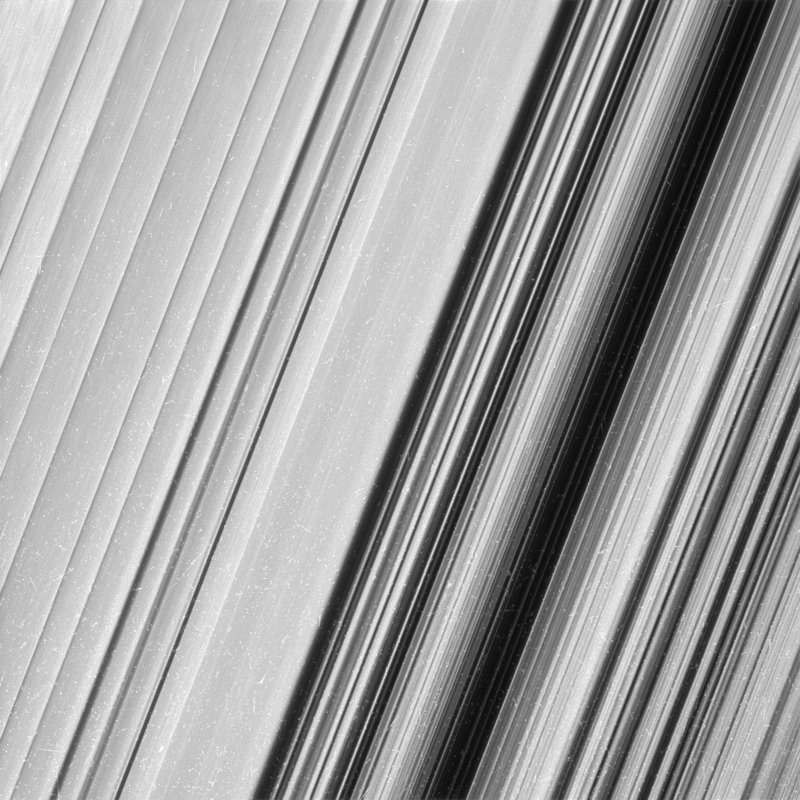 Those precious few observations only looked out on the backlit side of the rings, and the team chose short exposure times to minimize smearing due to Cassini’s fast motion as it vaulted over the ring plane. This resulted in images that were scientifically stunning, but somewhat dark and noisy. 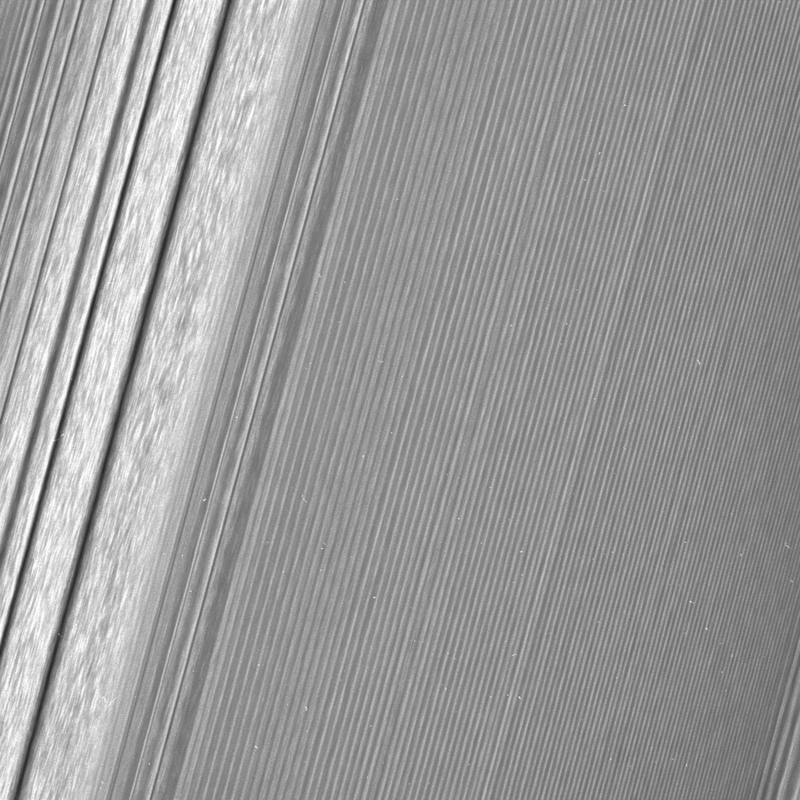 In contrast, the close views Cassini has begun capturing in its ring-grazing orbits (and soon will capture in its Grand Finale phase) are taking in both the backlit and sunlit side of the rings. Instead of just one brief pass lasting a few hours, Cassini is making several dozen passes during these final months. This image from NASA’s Cassini mission shows a region in Saturn’s A ring. The level of detail is twice as high as this part of the rings has ever been seen before. The view contains many small, bright blemishes due to cosmic rays and charged particle radiation near the planet. After nearly 13 years studying Saturn’s rings from orbit, the Cassini team has a deeper, richer understanding of what they’re seeing, but they still anticipate new surprises. This image shows a region in Saturn’s outer B ring. NASA’s Cassini spacecraft viewed this area at a level of detail twice as high as it had ever been observed before. Launched in 1997, Cassini has been touring the Saturn system since arriving in 2004 for an up-close study of the planet, its rings and moons, and its vast magnetosphere. Cassini has made numerous dramatic discoveries, including a global ocean with indications of hydrothermal activity within the moon Enceladus, and liquid methane seas on another moon, Titan. The Cassini-Huygens mission is a cooperative project of NASA, ESA (European Space Agency) and the Italian Space Agency. NASA’s Jet Propulsion Laboratory in Pasadena, California, manages the mission for the agency’s Science Mission Directorate in Washington. JPL is a division of Caltech in Pasadena. The Cassini imaging operations center is based at Space Science Institute in Boulder, Colorado. 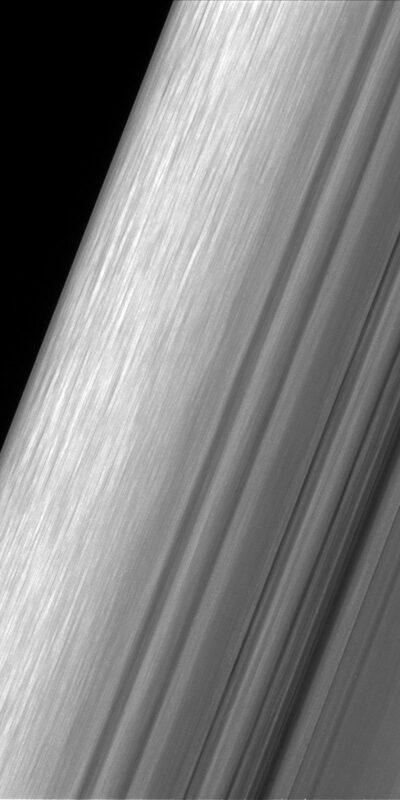 This Cassini image features a density wave in Saturn’s A ring (at left) that lies around 134,500 km from Saturn. Density waves are accumulations of particles at certain distances from the planet. This feature is filled with clumpy perturbations, which researchers informally refer to as “straw.” The wave itself is created by the gravity of the moons Janus and Epimetheus, which share the same orbit around Saturn. Elsewhere, the scene is dominated by “wakes” from a recent pass of the ring moon Pan. NASA Releases Close Views Showing Saturn’s Rings in Unprecedented Detail Reviewed by DR Ravenholm on March 21, 2017 .